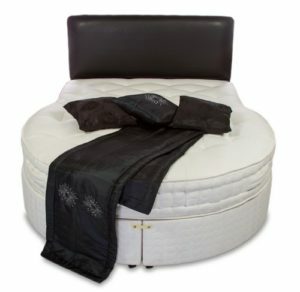 You may have an IKEA frame, a vintage frame, an unusual shaped room or just want something a little unique, we are able to manufacture virtually any sized divan base or mattress, including rounded-end beds (as photographed below) or corner-cut mattresses. Unlike many of our competitors who sell only what they purchase from their own suppliers, we can produce one-off products to meet your individual requirements whilst providing a cost effective service and more importantly, a quick turnaround. As well as being the perfect addition to your bedroom, you can be assured that your bed will be bespoke to you. The photo demonstrates a keyhole shaped bed produced in-house with our finest pocket spring mattress. As time goes on we shall add further bespoke images to demonstrate how versatile we can be.